Bengaluru, Karnataka, India – His Holiness the Dalai Lama flew from Delhi to Bengaluru yesterday and was welcomed on arrival by Shri H Amjaneya, Minister for Social Welfare in the Karnataka Government. After a powerful thunderstorm last night, this morning the sky was clear and the sun shone as His Holiness drove to Dr Ambedkar Bhavan. The approach roads were lined with Tibetans, many of them young students, eager to catch a glimpse of him. His arrival was marked by spirited drumming. Accompanied by his fellow guests, Shri Mallikarjuna Kharge, Leader of the Congress Parliamentary Party, and an old friend, and Karnataka Chief Minister Siddaramaiah, he entered the 1200 seat auditorium which was filled to capacity. The State Level Seminar on ‘Social Justice and Dr BR Ambedkar’ began with a group of musicians performing a patriotic song that ended with a recitation of ‘Buddham Saranam Gacchami’. There followed a customary presentation of bouquets and His Holiness joined the Chief Minister in lighting a lamp to inaugurate the occasion. A Kannada translation of a book by His Holiness, ‘Love and Compassion’, was released. In an extensive speech, first in Kannada and then in English, Shri Mallikarjuna Kharge paid tribute to Dr BR Ambedkar. He mentioned the Buddha Vihar at Kalaburagi that attracts tens of thousands of pilgrims on Buddha Purnima and the anniversary of Dr Ambedkar’s embracing Buddhism, and which His Holiness last visited in 2009. Referring to Dr Ambedkar affectionately as Baba Saheb he declared him to be both the father of the Indian constitution and the liberator of Dalits, but also a defender of women and the poor. He was driven by a vision of equality to make the country better. As well as being a lawyer he was an eminent economist, who participated in the setting up of the Finance Commission. Kharge congratulated the Government of Karnataka on their announced intention to set up a Dr BR Ambedkar School of Economics, modelled on the London School of Economics. Kharge described Baba Saheb as a staunch nationalist, someone who occasionally disagreed with Gandhi, telling him that social justice required the empowerment of Dalits. He advocated a social democracy in which Dalits would gain political power. He recognised the importance of education in the pursuit of this goal. Inspired by the ideals of liberty, fraternity and equality, Ambedkar eventually chose to embrace Buddhism because of its established traditions of equality and non-violence. Chief Minister Siddaramaiah paid respect to His Holiness as a man of peace in his speech in Kannada and reiterated his government’s pledge to establish the Ambedkar Bengaluru School of Economics. Acknowledging the Chief Minister, his respected old friends and older and younger brothers and sisters, His Holiness explained why he greets people in that manner. He said that all 7 billion human beings alive today are born the same way and die the same way. And while they are alive all want to live happily and avoid being miserable. All have a right to be happy. Consequently he feels it is essential that we recognise the oneness of humanity. “If we were really to see one another as brothers and sisters, there would be no basis for division, cheating and exploitation among us. Therefore it’s important to promote the idea of the oneness of humanity, that in being human we are all the same. His Holiness recalled that as a lawyer, economist and social reformer Ambedkar opened millions of people’s eyes. He noted that he brought about a revival of Buddhism in India, the land of its origin. Buddhism’s influence, he said, has extended right across Asia, but it began here in India. His Holiness spoke about the three Turnings of the Wheel of Dharma, of how during the first at Sarnath, the Buddha taught the Four Noble Truths, their 16 characteristics and the 37 practices of enlightenment. During the second Turning of the Wheel at Rajgir, the Buddha gave the Perfection of Wisdom teachings in the course of which he elaborated on cessation, the third Noble Truth and the path to it. This involved the wisdom of selflessness, of emptiness, which is not nothingness but an expression of everything’s existence in dependence on other factors. In the Buddha’s explanation of dependent arising he announced that nothing exists independently, much as quantum physics today states that nothing exists objectively. At the same time he commended his followers not to accept what he taught only on the basis of faith, but to examine and investigate it in the light of reason and only then to accept it. What’s more he taught according to the capacity and aptitude of his listeners, which means that he appears to have given different explanations on different occasions. 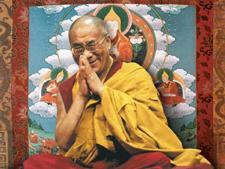 His Holiness distinguished three aspects of religious tradition—the common religious message of love and compassion. The varying philosophical views whose purpose is to support this message, such as the theistic traditions’ faith in a creator and the non-theistic traditions’ sense of responsibility and self-reliance. Finally, there are cultural traditions in all religions that derive from social customs that may be out of date and need to change. “When you have a good understanding of the workings of the mind and emotions, you’re in a better position to tackle your destructive emotions. Compassion gives rise to a sense of confidence and reduces fear. Under those circumstances it’s easier to use your intelligence clearly. It’s better to remain calm—calm, but not dull. When the teachings of the Buddha reached Tibet, we gradually became more peaceful and compassionate. Asked what impact living in India for 58 years had had on him, His Holiness said he’s been impressed to witness the real possibility of different religious traditions living in harmony with each other. And he said he loves the ancient traditions of karuna and ahimsa. About what freedom means to him, His Holiness remarked that if we accept that human nature is compassionate, freedom is positive, whereas if human nature was essentially angry, freedom would be dangerous. But, he clarified, along with freedom we have creativity and creativity is the fount of human progress. Ms Lakshmi wanted to know what was the biggest threat to humanity today and His Holiness replied—one sided education, an education system oriented to material goals, giving rise to greed, jealousy and anger, which in turn leads to human intelligence being put to destructive purposes. He added that too much competition and short-sighted goals contribute to making peace in the world elusive. Questioned about his own routine, His Holiness expressed contentment about meeting with people and exchanging views with them. He declared that he has little interest in entertainment in terms of listening to music or watching television, but values what ancient Indian psychology has to explain about the workings of the mind.